AgPLUS will leverage new state investments in 11 Central Valley Career Pathways Trust projects, as well as existing models, to develop more aligned and fully integrated career pathways in food and beverage manufacturing industries, connecting businesses, K-12 schools and community colleges. Components include a stronger focus on Career Technical Education (CTE) in K-12 education and earn and learn models, focusing on STEM-related curriculum development and successful student transition to higher education, and replicating paid internship and career awareness models across the region. The models include the Valley Industry Partnership (VIP) internship programs and Careers in Manufacturing. The VIP program is a partnership at Fresno State between leading companies including food processors and the Lyles College of Engineering, providing paid internships. AgPLUS will explore the opportunity to move the program from four year to two year institutions. Careers in Manufacturing is a partnership program of the Manufacturers Council of the Central Valley, with employers, educators and workforce development professionals. It is designed to increase the number of young people considering and training for careers in manufacturing and fill current and projected job openings, using outreach programs, employment and incentives for students to pursue additional education. 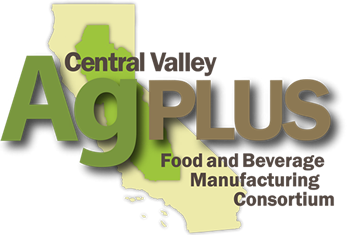 AgPLUS community college members will collaborate across the region on aligning their food and beverage manufacturing training curricula to begin producing a standardized supply of labor for KTS businesses throughout the Central Valley. With assistance from their Advanced Manufacturing Deputy Sector Navigators, the 13 member colleges of the Mother Lode/Central Region Consortium (ML/CRC) and the 15 member colleges of the North/Far North Regional Consortium (N/FNRC) will engage KTS businesses in developing standardized courses, degrees and certificate training programs that meet the needs of the Central Valley’s food and beverage manufacturers. AgPLUS will work with the Chancellor’s Office of the California Community Colleges to ensure policy and resource alignment, and implementation support. The ML/CRC and N/FNRC also will develop additional industry-vetted skill standards guides for a series of occupations within the KTS. Skills standards provide ways to upgrade skills, target education and training resources, shape curricula, and provide workers with portability of skills. The first skill standards guide was produced by the ML/CRC in 2013 through the Central Region Consortium’s C6 pilot, focused on food manufacturing maintenance mechanics. Additional guides will focus on selected high demand KTS occupations such as programmable logic controller (PLC) technician, machinist, and filling machine operator. Other occupations will be added as the Strategy is implemented.